Segafredo Virtus Bologna will sanction some players due to their unprofessional and disrespectful behavior. Although Bologna qualified for the Basketball Champions League Final Four, they suffered a loss to Pistoia on Sunday (7/4) which has made their playoff efforts in the Italian League that much harder. Despite the lost game, some players traveled to Milano in order to party which was caught on videos posted on social media. It was noticed by the club and they decided not to ‘turn a blind eye’ announcing that the players involved will be sanctioned. 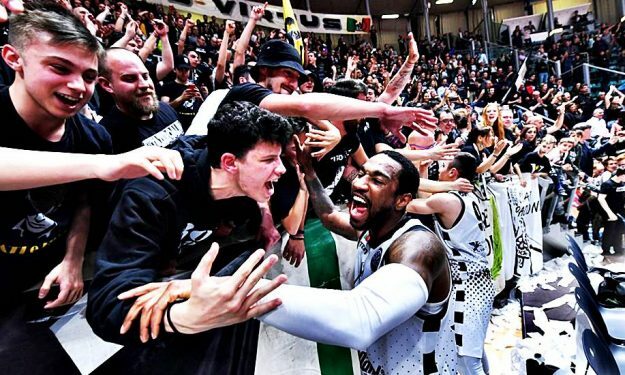 The Society Virtus Pallacanestro Bologna learned via social networks, watching videos published on the same, that some players, after the defeat last Sunday at home against the Pistoia, went to Milan where they stayed until late at night entertaining themselves in night clubs. Company, management and technical staff disassociate themselves and stigmatize the unequivocally documented and committed attitude in violation of the behavioral obligations imposed on professional players. The actions implemented by the involved seriously affect the ethical and cultural rules of Virtus Basketball, as well as being disrespectful in the times and in the ways towards the fans and the whole city. For this reason Virtus Pallacanestro will adopt sanctions against the involved athletes which it will determine together with its lawyers in the coming days.